FIGHT!‘s “Alright Guy” Duane Finley goes toe-to-toe with FIGHT!‘s “Canadian Guy” E. Spencer Kyte in a UFC Fight Night 28 Faceoff. 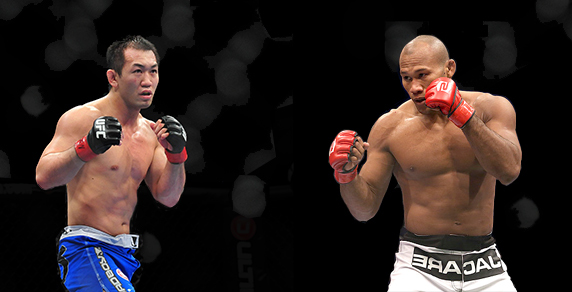 For this installment, Finley and Kyte take on the UFC middleweight fight between Yushin Okami and Ronaldo Souza. Let me take a moment to cherish my first victory in this series and take pride in bringing the coveted FIGHT! Faceoff Title back to the U.S. of A. I had been taking a shelling at the hands of my Canadian counterpart, but our last installment (Pettis vs. Henderson) helped stopped a ferocious backslide and turn my fortunes around. Yet, like any true champion, I’m willing to put my belt back on the line in quick fashion, and it’s good I feel that way because our next challenge falls a mere four days after our last go-around. There may be no fighter in the UFC more unheralded for his accomplishments than Yushin Okami. “Thunder” has been the Samurai gatekeeper to the championship tier of the middleweight division for years, and most who have faced him inside the Octagon have been reshuffled back into the fold. On the other hand, those fighters fortunate enough to get through his grinding attack have typically gone on to the next tier, where an even worse fate awaited them. Okami’s upcoming bout with Ronaldo “Jacare” Souza will once again bring the Japanese guardian back to his post. The former Strikeforce Middleweight Champion is looking for a title shot, and he has made short work out of the first two UFC-branded competitors he’s faced. That being said—and with no disrespect—neither Ed Herman nor Chris Camozzi present the level of challenge Okami brings to the cage. Souza’s biggest strength is a lights-out ground game, but Okami is one of the most difficult fighters to put on the canvas. Where Souza has been able to muscle opposition to the ground, Okami is one of the biggest, strongest fighters currently competing at middleweight, and putting him on his back will prove to be a difficult task. On the flipside, Okami will be able to put Souza on the mat with frequency. While I highly doubt he’ll be able to keep him in that position, especially during the early minutes, his grueling clinch game against the cage and multiple trips to the canvas will start to drain the Brazilian’s gas tank. There may be some touchy moments, but in the end, Okami takes the fight on the judge’s scorecards. While I believe Souza will one day be a legitimate threat to the 185-pound title, I don’t believe that time is now. Okami not only wins by decision, but also defeats a Brazilian fighter in his native land, and the proud Samurai will walk away from his post on Sept. 4 knowing he has done his job once again. So this is what it feels like to lose? I’m going to be honest, I don’t like it. Thankfully, this feeling doesn’t have to last too long, as we’re getting back in the cage on Wednesday, and my fine friend from the great state of Indiana is siding with the proven veteran over the relative UFC newcomer. I’ll take it, and I’ll take the victory too. I’m a big Okami fan, and like Duane said, I think he’s criminally underappreciated because he’s a grinder. “Thunder” is a tremendous protector of the upper echelon in the middleweight division, and he is one of the top gatekeepers in the sport, but I have maintained for quite some time that Souza has championship potential. While Duane is correct that Chris Camozzi, Ed Herman, and Derek Brunson are nowhere near the same level as Okami, these ease with which Souza dispatched each member of that trio is what he should be paying attention to, not their respective pedigrees. All three are solid, middle-of-the-pack UFC middleweights, and “Jacare” ran through them like they were rookies. Souza is the more dynamic talent, and his skills in the grappling department nullify a lot of what Okami does best. The Japanese veteran isn’t going to be able to simply smother Souza on the ground for 15 minutes, and I don’t think people are giving the Brazilian enough credit for his hands either. Yes, his submission game is still his primary weapon, but he lit up Brunson when they fought in Strikeforce, and his hands have continued to improve by leaps and bounds each fight. This will be a tough battle—and a great fight to watch on Wednesday night—but in the end, Souza will be the one who controls the action on the canvas, and ultimately earns the win. And with that, the FIGHT! Faceoff Title will make its way back to where it belongs—my hands. Daniel Cormier: "If you say I'm turning down a fight, I'll go looking for you."